The promise? A standalone camera app aimed at delivering photos with the much sought after "shallow depth of field". ie keeping a foreground subject in focus whilst the backdrop is pleasingly blurred, for pseudo almost "DSLR-like" photos. How does it work? 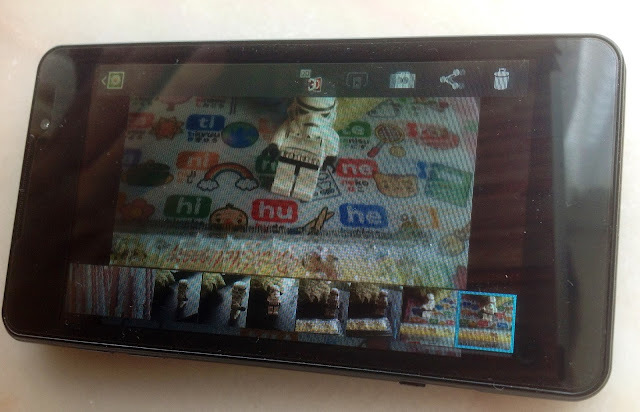 By making clever use of the LG Optimus 3D's twin back cameras, simultaneously snapping one "in" and another "out of focus" photo. The trick is to have the app efficiently isolate the desired foreground subject whilst blending it into the other blurred background image. Rather like how HDR blends exposures into a single end photo. There's speculation that perhaps the 3D camera helps the software to determine what is fore/background? Otherwise we may be treading in the less sophisticated territory of having the user performing a finger-paint selection of the desired foreground. 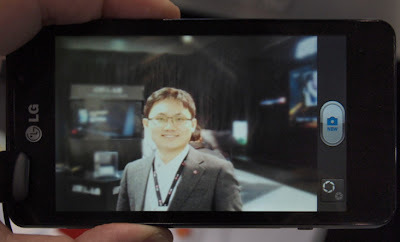 An article found at NAG Online article that mentions this mysterious "DSLR" application demonstrated with the launch of the LG Optimus 3D Max in late Feb at the MWC2012 event. Quote "The dual 5MP cameras also allow for better augmented reality apps to make use of the hardware, as well as doing some pretty clever things like using the camera to figure out how long something is (Smart Ruler) or to create a fake DSLR-looking shot with a greater depth of field than standard auto-focus cameras. Here I have to pause for a moment. The way LG is using these cameras is a lot like how Nokia achieves noiseless and sharper photos with the 808 Pureview. Nokia’s 41MP sensor interpolates pixels to create a smaller 5 or 8MP shot, working out which colours and angles are correct and mashing all the pixels together beautifully to create the final image. LG’s DSLR likewise does something similar, focusing the lenses at two different lengths digitally and taking their combined efforts to create good depth of field and colour reproduction, and to reduce noise. " Select the foreground from the background. Note the rather loose definition of the foreground subject! Bend for the final "DSLR-like" image with the LG bloke the focus of our attention and an otherwise distracting background all blurry. Without a doubt its a very novel use of a 3D smartphone camera! It would have been a genuinely unique selling point for LG's 3D smartphones to have this feature! Alas... I tried but still can not find this application for download anywhere... Perhaps it was just an incomplete demo piece of software that was shown at the MWC2012 but for whatever reason, never finally released. If this app gets a general release at some point, I will gladly give it a try. Drop me a note if you have any further info on this app! 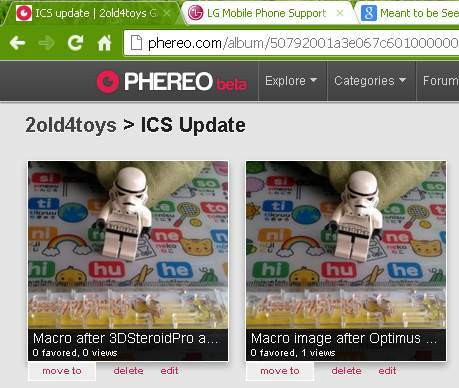 *Credit to Bether senior member of the XDA Developer forum's LGO3D section for finding the NAG article. In a YouTube video of the show, we catch tantalisingly glimpse of an icon for "Smart Focus" on the LG Optimus 3D Max but are not treated to a live video demo. I believe that "Smart Focus" and "DSLR Shot" are the same thing. 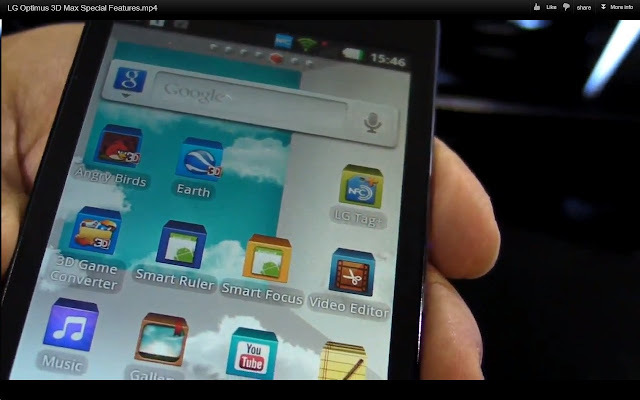 The "Smart Ruler", app IS demo'd in the above video that does make use of the LG Optimus 3D's twin cameras in triangulating distances. Much more elaborate than the typical ruler apps you find in the Google Play store. At the time of writing, it is available as a free download from the Korean LG World app store. 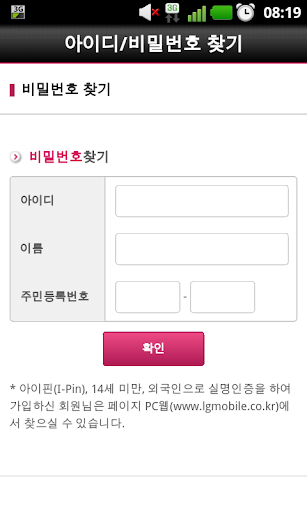 If you have an LG 3D smartphone, and have a Korean ID, please login and grab the app. Do us a favour and share the .apk installer file with the LGO3D XDA guys... we really want to have it but Korean LG World on-line registration is only available to people with a Korean social security number. 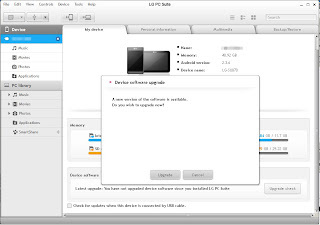 Note, you NEED an LG 3D optimus smartphone to be able to search the Smart Ruler ap. 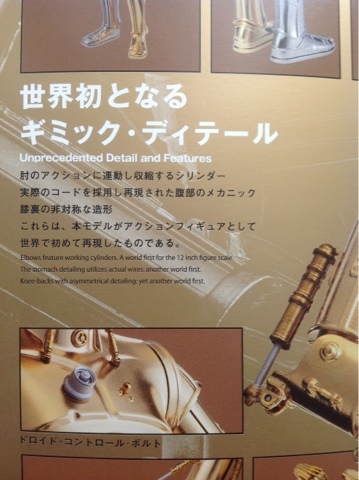 Otherwise it's hidden from view. Before electronic entertainment... I remember back in the day when I were a wee lad in short trousers... at some newspaper stands of the the bigger UK train stations (must have been Picadilly) you could buy exotic imported American comic books for 12p a shot. You can tell they were imported because they had a purple ink stamp in the corner indicating the equivalent local price. That a favourite uncle of mine had a modest stack of them at my grandparents house and I'd pour over them on visits." 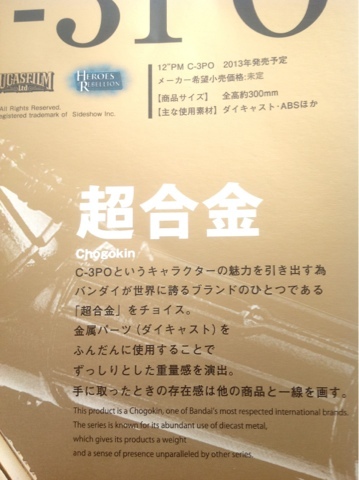 Shogun Warriors" is a title that sticks in my memory! 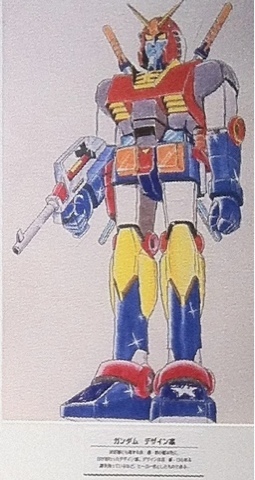 Giant Giant robots that transformed and combined from their elaborate smaller component vehicles. All kinds of awesome... 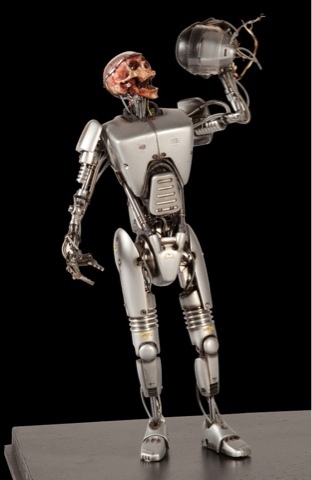 I'll get to the robots later. Here's a nostalgic taste of those old adverts that ran in the comic. Still looking for the Sea Monkeys one. Energised Spiderman. I never had this but I knew a kid that did. It was a massive fixed pose figure. All hard plastic with a battery operated mini light bulb gimmick in one hand and a spring loaded retractable string contraption embedded in the wrist of his permanently raised left hand. Amazing? Actually even then I found it a bit rubbish... But it was a nice big statue at least. Macro update? Seems like no flower icon in the UI to indicate new 3D macro capabilities BUT... It really does seem like we CAN focus on objects much much closer than pre-ICS with the 3D stills mode. I can get a green square with a beep that indicates a good focus lock on anything as close as 8cm!!! Mind you... The built-in alignment software can't cope so well. The range of shift it allows is insufficient I find. I'm going to need it passed through 3DSteroid to see the results of its more broader alignment functions. The native screen-cap function is now disabled within the camera and gallery app... so the following was clumsily taken using another camera. The post picture taking UI is different! I like the scrollable photo reel along the bottom It fades away after a couple of seconds left alone. All in all a definite improvement on what we had before! "update for Optimus 3d 3d feature (DSLR shot, ruler tag, 3d macro, manual focus, zooming while recording)." OK I'm Home~ woken up my laptop... plugged in the phone via USB... Prompt on laptop screen says auto-run something or another... probably a bit of software on the phone itself... Now the laptop is telling me to install something else... It's downloading it of the internet now. Oh my... serious iTunes for Windows flashbacks... hope it's not going to bring my PC to it's knees. OMG the swiping between screens is SO much smoother than before... is this ICS? YES!!! 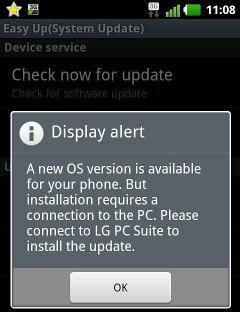 Android 4.0.4 from LG for the Optimus 3D cube! Better late then never... and a very painless upgrade it was too :) Yeah... mine is a Korean 3D Optimus cube but outside of Korea is known as the Optimus 3D Max... You probably don't have long to wait for your ICS update, sorry to rub it in your nose... Sit tight! 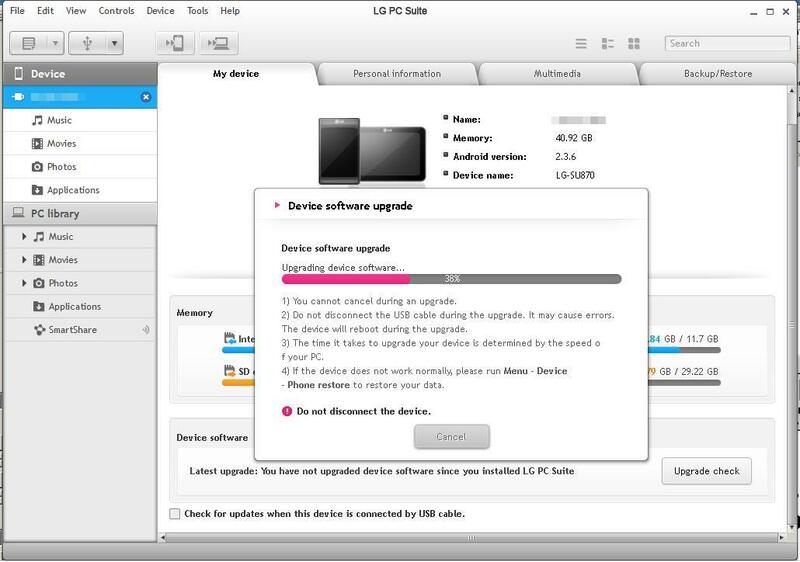 This is a great indication LG WILL get you your update! 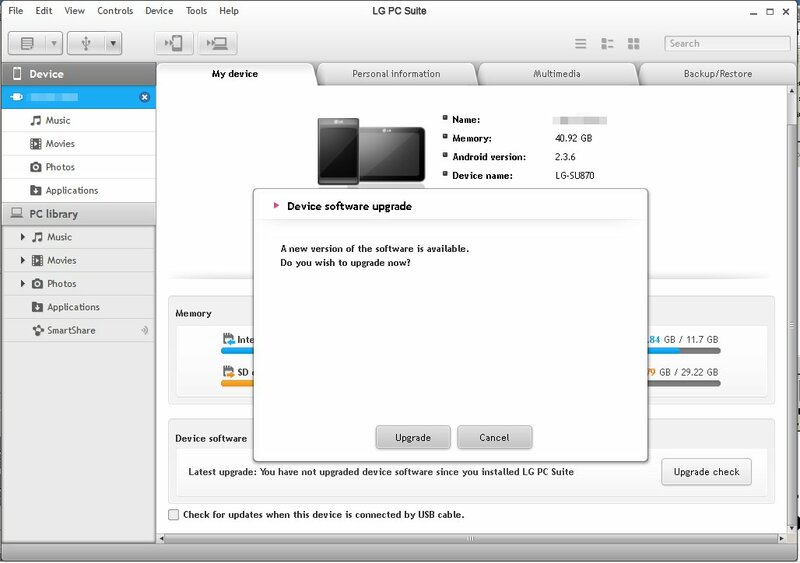 I'm so hoping this update is Android 4 AKA Ice Cream Sandwich (henceforth referred to as ICS). I've been finding iTunes on Windows PC a dreadfully slow starting software for a long time and was glad to see the back of it. 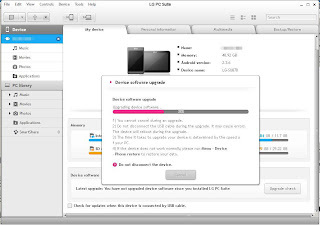 I was quite happy I'd never installed anything on my laptop relating to Android up to now and I'd wanted it to stay that way, what with Over-The-Air OS updates an early feature on Android (appeared before iOS) but Nooooooooo... I'm now prompted to hook up to a PC... in this Post-PC-Age... I'm not at home right now so I have to contain my excitement till later this afternoon. Good thing it's Saturday, I've the whole weekend to play with this update. 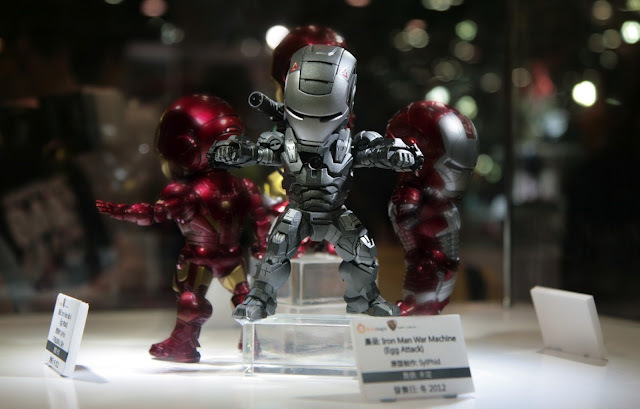 Snapped these at ACGHK2012. 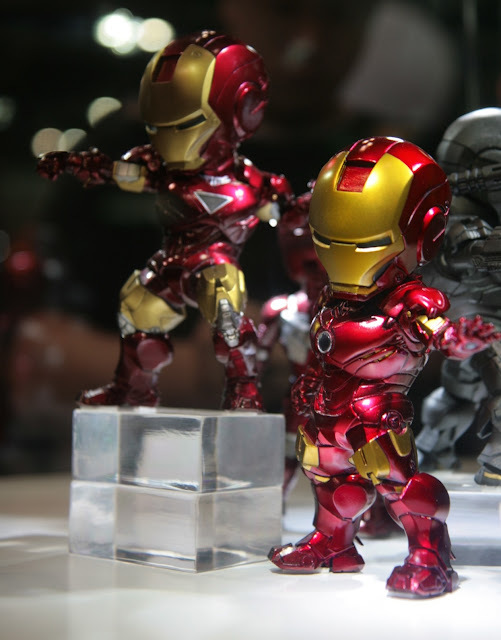 Seen these available as resin kits. They look fab all painted up. Sizable too... Similar to a mighty mug I think. [Q] Best 3D specific software for 3D Smartphone users? 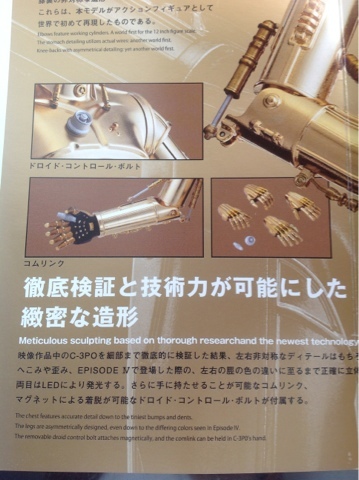 Latest gadget? 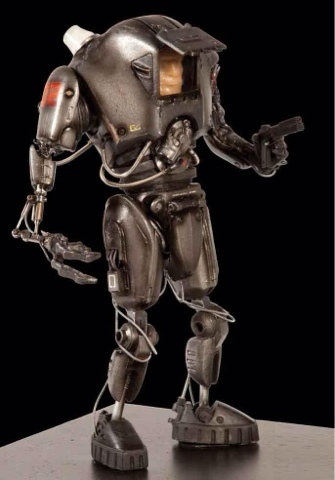 I've recently acquired a 3D equipped Android Smartphone. Got it just because I wanted to evaluate the 3D features. To test out how I'd like having a 3D stills and video capturing gadget that is always with me. One that allows me to immediately review, even edit what I'd just captured in said 3D. I'd love the hear what 3D software the rest of you guys recommend that specifically makes use of a built-in glasses-free 3D parallax barrier display, and/or twin back cameras. 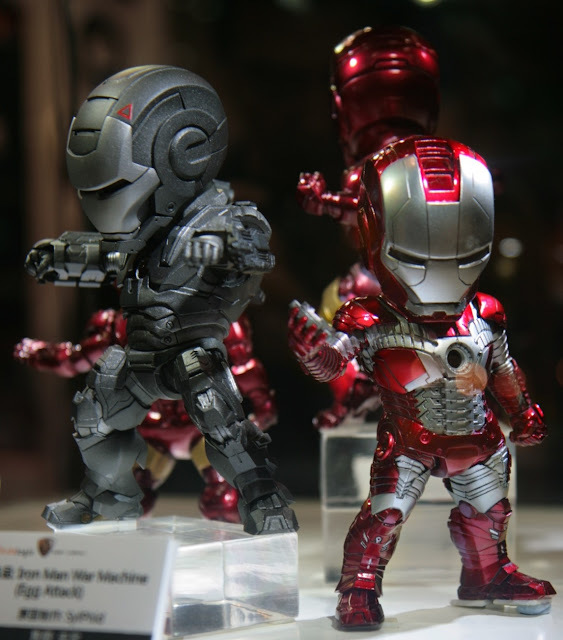 Features that make the LG 3D Optimus/Max, the 2011 HTC EVO 3D, and the Sharp 3D phone stand out from the rest of the overcrowded Android... crowd. There are newer Android Smartphones released with faster CPU, higher resolution this, higher capacity that... I've honestly switched from iPhone to Android purely because there's no Apple iOS 3D smartphone on the market at the time of writing. Other non-3D related smartphone specs simply don't interest me at the moment. All that really matters is the 3D. Personally I make frequent use of, and can highly recommend the following 3D software... All available on the Android Play marketplace. 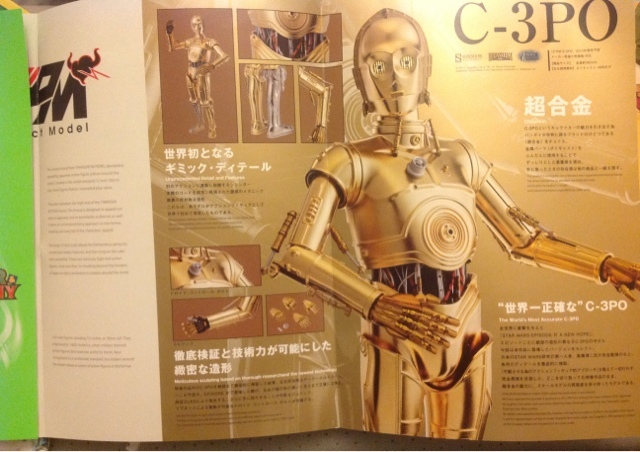 3DSteroidPro can allow you to take 3D photos in cha-cha mode (like many apps can...). Useful for capturing static macro or distant 3D landscape scenes. 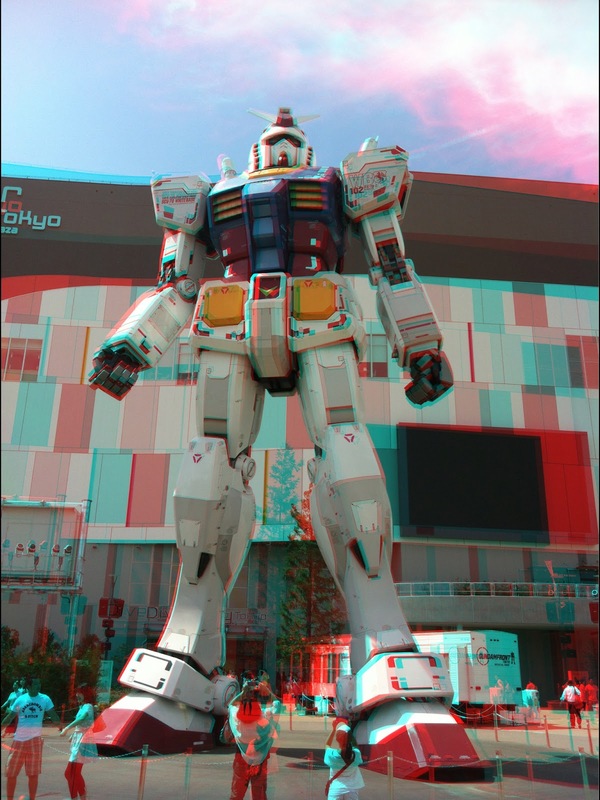 However, its the included 3D photo editing functions that make this app really special! Not only does it allow the common horizontal shift adjustments to left right images, but uniquely, it also caters for vertical and rotational alignment tuning! The only smartphone software I can find that can do this! Somewhat let down by its lacking export of MPO, while it's Side by Side Jpegs are simply not recognised as 3D photos by my 3D Optimus photo gallery app is quite puzzling. They display in 3D under Tobidale though! Try the free version first but rest assured that 2 USD for the Pro version is worthwhile. It lets you save photos at high resolution and also unlocks the auto-alignment feature! Tobidale3D display 3D pics both in JPS and MPO format stored on you phone's local memory or from the many public web galleries, conveniently grouped into this one handy app. Notably, you can zoom into your 3D pics, and provides a simple crop and save function that is genuinely useful. PHEREO browse 3D photos from their big web gallery. 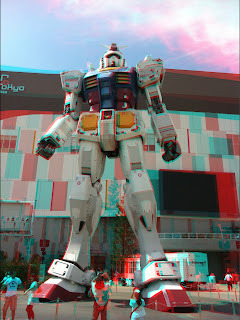 Can upload your own 3D pics to their gallery for sharing! Interested in 3D specific apps. Let me know of your recommendations. I want to share your findings! Shell Ferrari diorama pamphlet needed! PM me for goodness sakes! 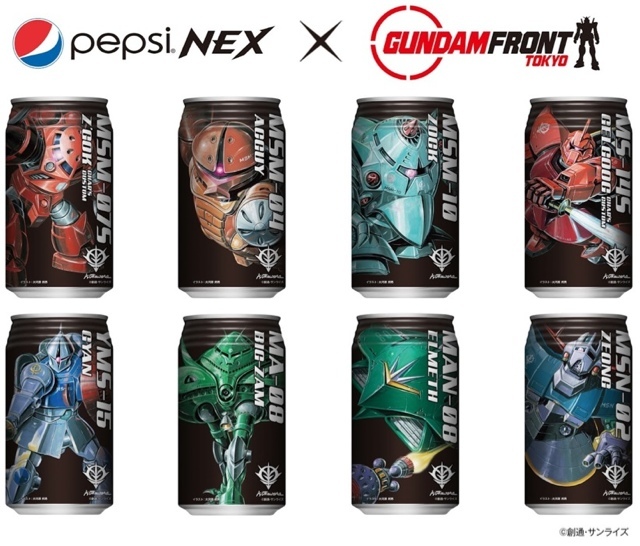 I pre ordered mine already. Very informative review. Exactly what I was looking for. Leaning towards passive 3D glasses to avoid flicker. 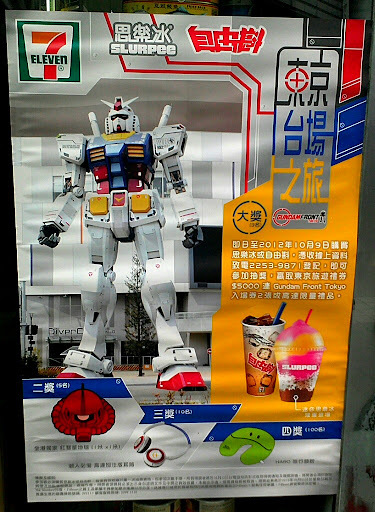 What manner of Gundam tat is on offer this time? I can only make out a Harro shaped inflatable neck pillow. Anyone know able to read the text details in this poster let me know. The ShowMe3D App for iOS! I particularly like that it works with the .mpo file format. Like .jpg is a widespread accepted standard format for 2D photos, .mpo does the same for 3D images. Supported by Fuji's 3D digi-cams, their 3D picture frames, Samsung, LG 3D TV's, even the Nintendo 3DS saves its pictures and is able to read .mpo 3D photos taken with other 3D devices. If you want a 3D lenticular hard copy print of your photo developed? They want a .mpo file. That showMe3D has .mpo file support from the get go is fantastic. I've been successful in downloading other people's .mpo images to view via ShowMe3D using the Hasbro My3D viewer. This App unlocks a lot of underexploited potential by allowing users to easily create images to be enjoyed using the My3D viewer. If you have a Hasbro My3D viewer then I absolutely recommend this App without any hesitation! 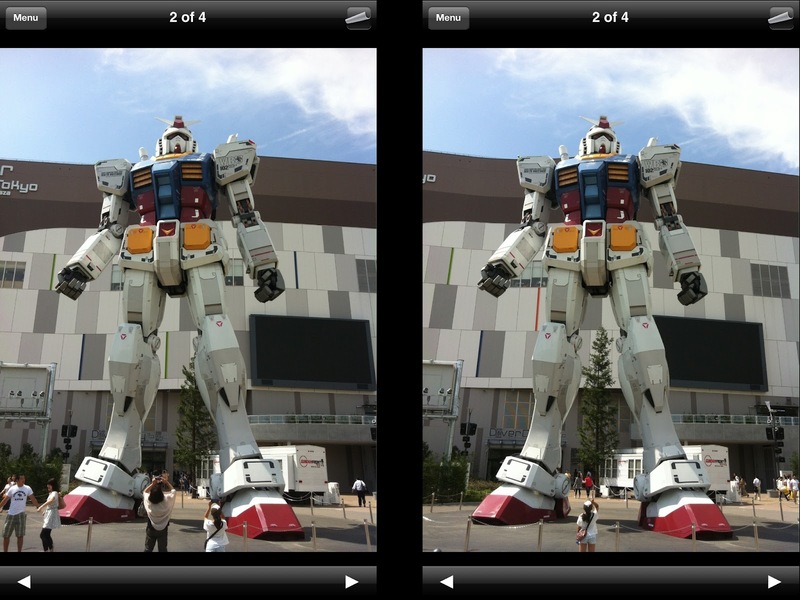 It's a killer app to be able to make your own 3D pics with an iOS camera equipped device. Unwanted G-AGEing chips and cards? 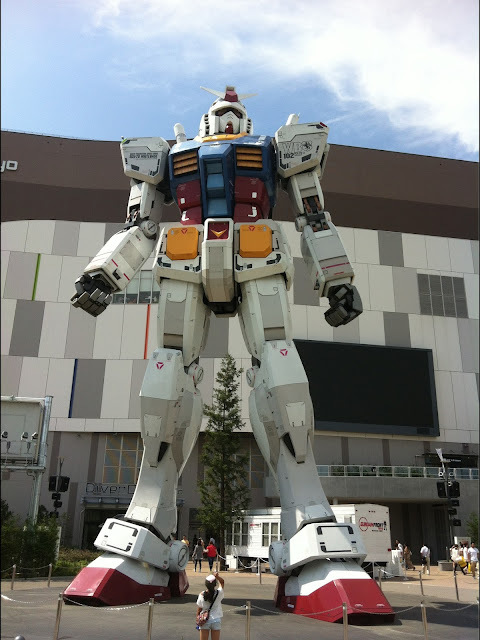 "Gundam Crisis" is the 1st life sized 1:1 scale full-on RX-78-2 Gundam built for the enjoyment of the general public. Posed lying on its back for maintenance, sporting a very MG OYW sculpt with a mat finish weathered paint job. The game involves a group of participants in a race to seek out several scattered docking points for your Gundam PDA's registration. You get to run around it and observe this sleeping giant from a high vantage raised walkway. The first to find'm-all gets to go on a mission to pilot the Gundam! 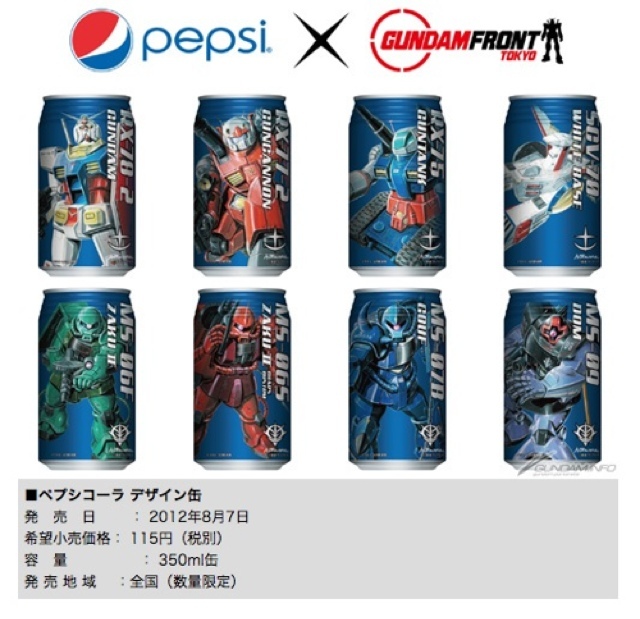 Look out for several "exclusive" on-site store merchandise including an MG RX-78-2 ver Gundam Crisis which is just the OYW version re-boxed (tell me if there are other reasons to pick this up). 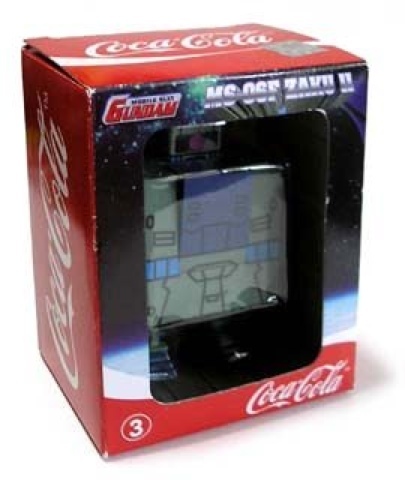 Also a Metal Composite GFF RX-78-2 (again in unique packaging). 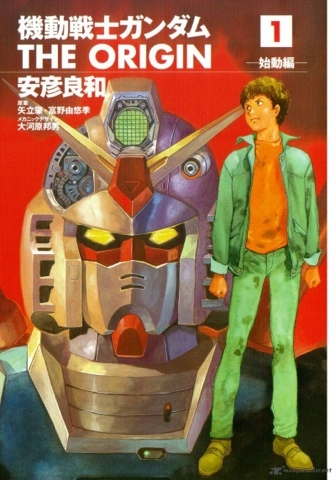 Gundam Crisis attraction Skip to 1:49 for the good stuff to start! 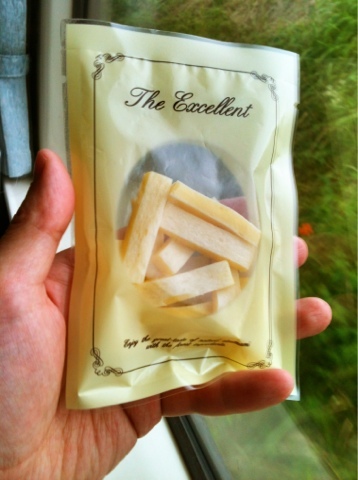 Otsumami: beer-snacks. 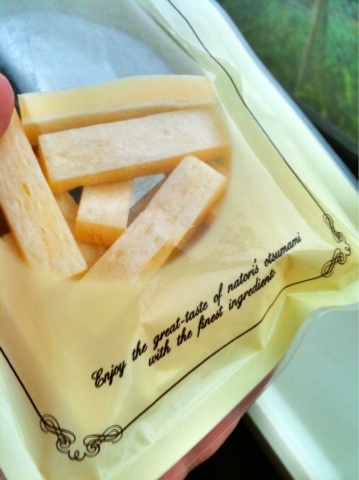 In this case its sticks of cheese sandwiched between thin slivers of squid... An "Excellent" snack it is too! 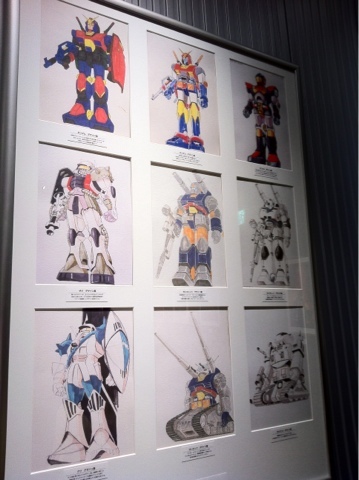 Alternate Mobile Suit Gundam designs! 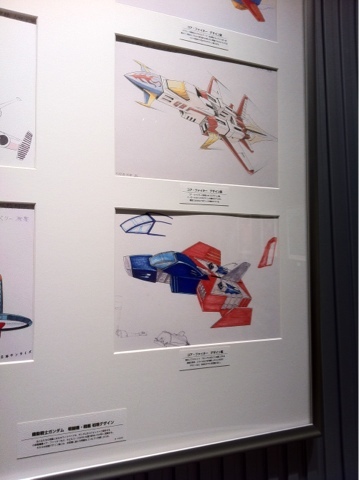 Some of the original artwork on display at the Gundam Front 2012. 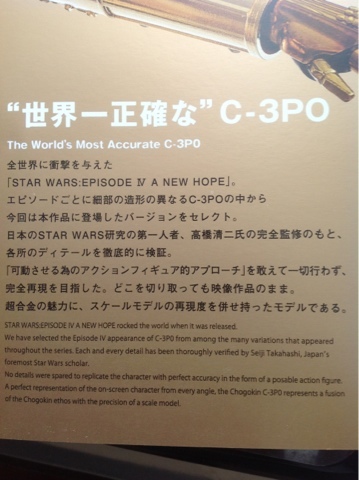 I could have shot a video but I'd rather those of you who can, go fly to Tokyo to see these exhibits in person yourselves rather than have the experience spoiled in advance. 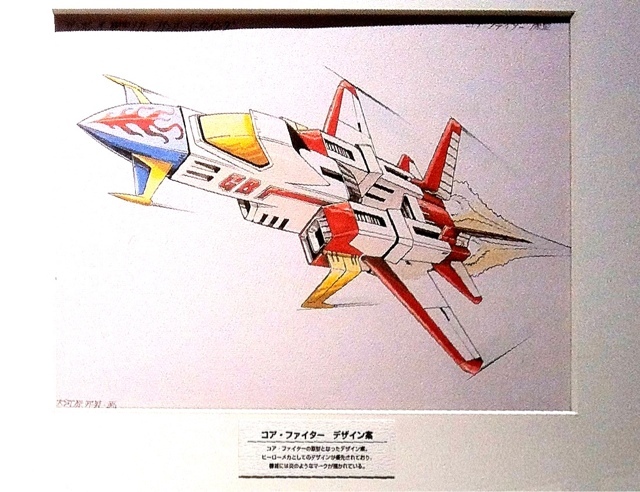 The proto-Core Fighter has a bit of a G-Force vibe to it IMO. 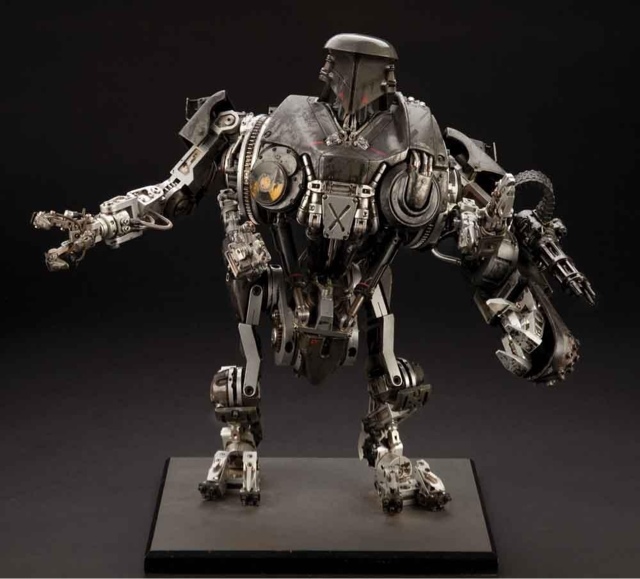 See the McRobots come to life in animated cartoon form!!! What a great find. 2old4toys t-shirts and other assorted tat! Keep your eyes open as there's usually some Cafe Press discount code being offered. It was a couple weeks before Fathers day and Bought an XL T-shirt (turned out a bit too big for me) and a large white mug. Both were with free postage in the UK arriving just a few days after making the order. Which was a surprise 'cos I thought CafePress had their original factory in the Americas. Do they have a similar factory in Europe too? T-shirt print quality is fine. Will report back how it stands up after a few machine washes. The mug is still at my parents house.